Insurance Industry Going GANGSTER ! Threatens To Jack-Up Rates if HCR Passes ! The insurance industry inadvertently gave health reformers the best argument we ever could have had to pass a public option and the strongest possible regulations on insurers. Declaring that rates will go up dramatically if reform passes, insurers launched a full-scale open assault on the idea of any reform at all yesterday, except I guess a reform plan especially tailored to them and their profitability. What they left out of their little study is that they are the ones who decide when rates go up because the biggest companies have very little competition in most of the markets they are in. There is no federal rate regulation, there is no anti-trust enforcement in insurance (they are specifically exempted from it in the McCarran-Ferguson Act), and unless there is a public option, there will be little competition. They will be the ones who decide if the rates go up, and they have just guaranteed they would raise those rates if we don't stop them from doing it. It's sort of like the sheriff in Blazing Saddles holding the gun to his own head, and saying "back off or I'll shoot." The insurance industry is saying that if they don't like what's in the bill, they will just decide to arbitrarily raise the rates. But we can stop those rates from going up by checking the insurers' power. That's why a public option, real competition for an arrogant out-of-control, way-too-powerful industry, is so essential. Without it, we are left to their whims, and anytime, for my reason, they will just jack up their rates. If their stocks go down, if they just want more profits, if some regulation they don't like is passed, they will just raise their rates. With a strong, robust, nationwide public option, we can force insurers to the table, and give them real competition. Personally, I think we ought to repeal McCarran-Ferguson and impose tough rate regulation as well. That would really open up competition and guarantee lower prices. But at the very minimum, we have to have a strong national public option. The insurance industry has just reminded us as to why that is. Thanks for the help in making our case, friends. While over 47,000 Americans are dying each year due to lack of coverage this Sic threat by the insurance companies PROVES that we MUST have A STRONG PUBLIC OPTION.....The Insurance Companies are openly threatening that if The HCReform Plan does not benefit THEM then They Are Going To PUNISH All Americans By JACKING UP THEIR RATES !!!!! This is TREASONOUS AGAINST AMERICANS !!!! Anything short (i.e. co-ops, opt-in/opt-out, triggers etc...which are all WEAK) would result in higher rates from the gangster insurance companies and NO true, competitive alternative for We The People, topped off with a MANDATE (law forcing everyone to buy high-priced, unaffordable coverage or be penalized) ! ANY...Yes ANY POLITICIAN who sides with these gangster insurance companies should be charged with TREASON !!!! 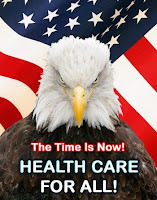 For Our RIGHT To Health Care !